From a Los Angeles hotel conference room, the Associated Press reported of Maria Sharapova’s recent positive test results for performance enhancing drug(s). During her passionate speech, tennis phenom – Sharapova revealed that she was informed of the outcome via a letter from the International Tennis Federation following cursory tests administered during the Australia Open. Throughout her presentation, Maria Sharapova comported herself quite well and characterized the matter as an honest mistake made out of sheer ignorance. The P.E.D. in question – Meldonium, is a drug that has a legitimate medical purpose and only listed as a banned substance by W.A.D.A. (World Anti-Doping Agency) as of January of 2016. To fully analyze this issue, let’s dive further with an analysis of this pharmaceutical and its varied uses. Mildronate, Mildronats, or Quaterine are scientific names that are generally not found in the vocabularies of Western society. Furthermore, the code 2-(2-Carboxyethyl)-1,1,1-trimethylhydrazinium wouldn’t be recognizable by most medical service providers with the exception of modern-day chemists. Perhaps, avid steroid producers may recognize acronyms such as THP and MET-8 as active ingredients for inclusion within some questionable energy-boosting supplements. The chemical code C6H15N2O2+, a white powdery raw product, has origins at the Latvia Institute of Organic Synthesis; innovated by Ivars Kalvins of the Latvian SSR Academy of Sciences. Meldonium’s intended medical use was for the treatment of cardio vascular related Myocardia Infarction as well as Angina. According to the National Institutes of Health (N.I.H. ), angina is described as intense pain; feeling like the squeezing of the chest/heart area that is caused by the lack of oxygen-rich blood. WebMD deems Myocardia Infarction to be a heart attack (a death of the heart) when one or more chambers becomes blocked. Subsequently, heart tissue is deprived of vital oxygen supply (cardiac ischemia) and will die if the duration of the circumstance extends beyond tolerance. The United States has refused to permit the use of Meldonium in any form though the pharmaceutical is popular among former Soviet Union nations. Members of this localized scientific community claim that Meldonium greatly “contributes to cellular energy metabolism; thereby, acting as a regulator of energy metabolism.” The product is typically mixed with water or other liquids when consumed orally or otherwise injected. Since there’s such an influence on the circulatory system for improved performance among heart patients, Meldonium is a growing drug of choice among athletes who’ve sought an edge by means including blood doping. This drug has claimed casualties such as Russian ice skater – Ekaterina Bobrova who failed her tests during the 2016 European Figure Skating Championships. Other eastern European athletes have been sanctioned by their involvement with Meldonium like Russian cycling champ Eduard Vorganov. During her news conference, Sharapova made the calculated effort to remind reporters that W.A.D.A had only banned the substance in January of 2016. 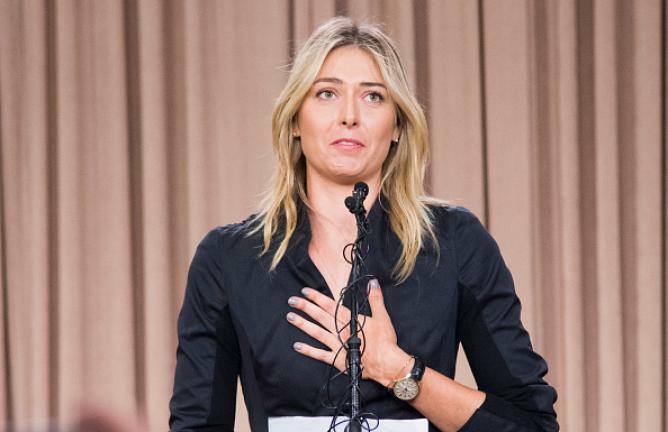 Sharapova did NOT inform attending journalists that W.A.D.A. periodically issues bulletins to update substances that are under heightened scrutiny with the increased probability of being added to their “DO NOT USE UNDER ANY CIRCUMSTANCES” list. In addition to W.A.D.A., partner organizations such as U.S.A.D.A. in the United States, UKAD in the United Kingdom, and SLOADA in Slovenia usually coordinate to adopt rules changes in unison. In our era of global competition, they cooperate to reiterate communications for the benefit of athletes within their jurisdiction. Now provided with this basic information, we begin to assess Sharapova’s statements to explore inconsistencies. Logic from the legitimate medical community states that no medicine should be administered on an ‘as-needed’ basis for extended periods such as 6-years. We easily see that, unless this tennis great was suffering from chronic cardio-vascular disease, there was no reason for her to be using Meldonium. Finally, we know that elite professional athletes have an athletic entourage with diverse functionalities that range from scheduling and logistics to equipment upkeep, dietary requirements, and rules compliance. Even if Sharapova opted to ignore her most recent January 2016 communication of uniformly banned substances, it is statistically unlikely that, in 2015, she would’ve overlooked the mentioned scrutiny of one drug while complying with others. Neither Sharapova, W.A.D.A., or the International Tennis Federation have commented on ‘next steps’. The sport of amateur & professional tennis has been perceived as non-muscular athletic competitions such that they’ve largely escaped the speculation of doping. Potentially, there will be more surprises that emerge along with administered fines/suspensions to be imposed on Sharapova. Moreover, as the layers of corruption throughout European sports is further unpeeled, we expect significant bombshells related to other elite athletes in Europe, the Middle-East, and Arab nations. Probably Maria’s racket is NOT roided but it certainly is juiced.